Lucia's Imports works directly with artisans in Guatemala to provide beautiful and functional products. Bracelets made of iridescent beads in various colors for children and youth. Beautiful, handcrafted, loom beaded bracelets in 6 iridescent colors. 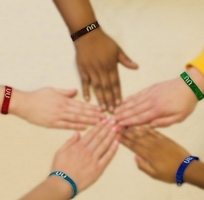 These fun accessories are perfect for youth who want to show their UU pride. They feature a 3 loop and bead closure that allows for some size adjustment.